It's finally getting cold here in sunny California. Cold and rainy. So, I felt a nice soup and sammie night was in order (again). The first menu that always comes to mind when soup and sammies are in order is Rachael Ray's Mini-Meatball Soup and Grilled Four Cheese Sandwiches. 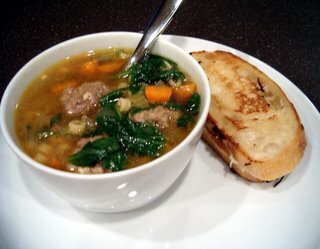 She also calls this Italian Wedding Soup and you can find it in her Comfort Foods cookbook. Other than making the meatballs, this is a very easy chop-and-drop recipe. There's also a nice little "pocket of time" when the meatballs cook for you to make the grilled cheese sammies. So, despite the length of the recipe and ingredients, it can be made in around 30-40 minutes. And if you have a George Foreman Grill, then use it as a panini press! In a deep pot over medium heat add oil, chopped carrots, celery and onions and bay leaves. Season with salt and pepper. Cover pot and cook veggies 5 or 6 minutes, stirring occasionally. While the veggies cook, combine meat, egg, garlic, grated cheese, bread crumbs, salt, pepper, nutmeg. In a small skillet over medium low heat, combine oil, butter and garlic. Cook garlic in butter and oil gently for 2 or 3 minutes. Remove garlic butter mixture from heat. Place a large nonstick skillet on the stove over medium high heat [or heat up your Foreman Grill]. Using a pastry brush, brush 1 side of 4 slices of bread with garlic oil and place buttered side down in skillet. Top each slice with equal amounts of the 4 cheeses, distributing them equally over the 4 slices. Top each sandwich with another slice of bread brushed with garlic butter, buttered side up. Flip the grill cheese sandwiches a few times until cheeses are melted and gooey and bread is toasty and golden. [See, if you use your Foreman grill, it cuts out steps. Just put the top down so the sammy grills on both sides at once.] Cut grilled 4 cheese sandwiches from corner to corner and serve. And there's not a dumpling to be found in the whole thing! We first tried this recipe on a cold Saturday afternoon after watching her 30 minute meals. We made the whole thing, the soup, the sandwiches and the frozen bananas. My kids loved it. Unfortunately, I had lost the recipe. I'm so glad I could find it here...THANKS!!! I made this soup today and it is fantastic! Used about 2 pounds of ground turkey and made the meatballs very small so there are lots of them. Also used frozen spinach and it worked just fine. Thank you for the recipe! I just made this today. Its one of my favorite soups. I'm new to your blog - glad I found another die hard Rach fan. I've been cooking with RR since before she was on Food Network. I live in NY and when she was first teaching 30 min meals in Albany - her first 2 cookbooks were available at the local Price Choppers. I tend to cook from her earlier works - like Comfort Food & 30 Min Vol 2. My 30 Min Meals, Vol 1 has a picture of Rachael and the co-host of her Albany Show (Dan Dinicola) on the cover. The premise was she would teach him how to cook a meal each episode. Her 2nd book was her Open House book - which originally had a blue cover, yellow sun spirals & Rach looking soooo young! Can't wait to make this for my son's 4th birthday party! He loves this soup!! I did the same as Barbara and used ground turkey and frozen spinach.....it is delish for sure! I plan to try this dish with Orzo noodles instead. I am an excellent cook and my husband is looking to try this one. I will let you know how it turns out after I make it. I am making this now....the only thing I do different is to cook the pasta alone. There are just 2 of us, and I found that with the left overs the pasta sucked up the left over broth..so I keep them apart until serving. He loves it and so do I.